"My sister made these sandwiches for our family reunion and my pickiest eater has told me they're her favorite food. The crackers really add a lot of butter flavor!" In a large saucepan over medium heat, combine shredded chicken, condensed soup, poultry seasoning and crushed crackers. Cook, stirring frequently, until mixture is hot, 15 to 20 minutes. Serve on buns. Make spicy, slow-simmering Buffalo chicken for sandwiches. My family was not impressed with this recipe at all. It was too mushy. I would add more chicken and less crackers. Taste was also kind of bland. Delicious! 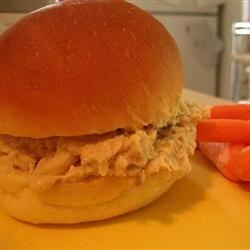 For all the "anti-mushy" folks: shredded chicken sandwiches are *supposed* to be mushy.